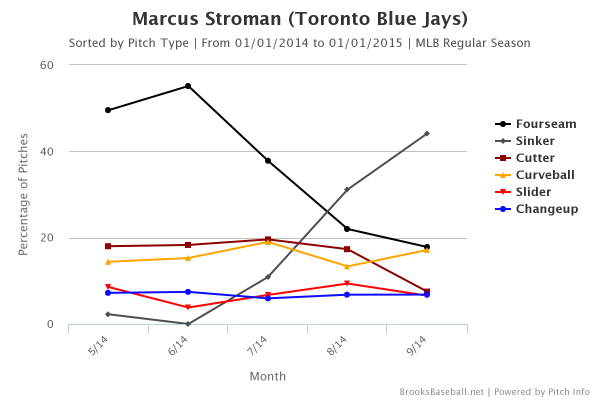 That’s Stroman’s big-league 2014, broken down by month. There’s no arguing the major trend: over time, Stroman threw more two-seamers, or sinkers, and far fewer four-seamers. It’s a dramatic shift, and it’s a dramatic shift in the middle of a year. Stroman became something he hadn’t been before. Stroman started to use the sinker more often in his July 19 start against Texas, after finding a grip he was comfortable while fiddling around with a baseball at home. I’ve been making .gifs of pitches for a long, long time. Back when I was first getting started, and more comfortable with the process, I started to pay close attention to the catchers. Something I noticed quickly is that catchers almost always close their eyes as the baseball is arriving. Of course, it’s not conscious — it’s just the automatic, instinctive response to deliberately getting in the way of a projectile flying at 90 miles per hour. Now look at Dioner Navarro. Look at his eyes. He never blinks. Even he can’t take his eyes off of Marcus Stroman’s two-seamer. It’s one thing for a pitcher to introduce a new pitch. It’s another thing entirely for a new pitch to be introduced and then used so heavily, so rapidly. Stroman’s sinker, in this regard, is exceptional, and I wanted to try to find some comparisons. When I’ve played with this kind of methodology before, I once found that Stroman throws a slider that’s a lot like Corey Kluber’s slider. This time, I was just focusing on sinkers, and I pulled up the Baseball Prospectus PITCHf/x leaderboards. And that’s it. That’s the whole group. Granted, in 2013, Halladay was bad. In 2012, he was close to average. But from 2008 – 2011, Halladay was perhaps the greatest starting pitcher in baseball, and his sinker was a huge reason why. Over those four years, his sinker was an even better comp for Stroman’s. He used it to generate 62% grounders. Two-thirds of those sinkers went for strikes. Stroman threw 70% of his sinkers for strikes. It just generated 66% grounders. Stroman was comfortable using the sinker when behind in the count against all hitters. Same when he was ahead in the count. Same when he was even. Same on the first pitch. Same with two strikes. He’s got other pitches, a lot of other pitches, and he still has his four-seamer, too, when he wants to elevate some heat, but the sinker has given Stroman something he didn’t have: a groundball pitch he can locate and use to get quick outs. Usually, you don’t see a big change in a pitcher’s groundball rate unless he’s made a big change to his arsenal or approach. In 2013, in Double-A, Stroman posted a league-average groundball rate. In 2014, in the majors, he was just short of two standard deviations above the average, and that includes his first half in which he didn’t throw sinkers. What Stroman will sacrifice are a few strikeouts. He’ll also probably sacrifice a few pop-ups. But now Stroman will be better able to keep the ball in the yard, and he’ll be better able to work deep. In 2013, in Double-A, Stroman averaged 4.1 pitches per plate appearance. In last year’s first half, that was also 4.1. In last year’s second half, he trimmed that rate to 3.8. Previously, Stroman would’ve averaged about 24 batters per 100 pitches. In the second half, that improved to 26, demonstrating his better efficiency. Stroman posted a better second-half adjusted FIP and xFIP than Max Scherzer and Jordan Zimmermann. And Stroman wasn’t even pitching to a particularly good receiver, in Dioner Navarro. For the season ahead, Stroman will get to work with Russell Martin. That would make almost anyone better. As much as people have talked about the Blue Jays maybe needing to add an ace, it would appear they might already have one. Stroman hasn’t yet proven himself over a full year, much less a series of them, but the talent is obvious and the results are encouraging. Stroman was a quality young pitcher before adding Roy Halladay’s sinker. Then, he found it, almost by chance. About a year ago, the questions concerned whether Stroman would be able to hold up as a starter in the major leagues, given his size. To that question, we don’t yet know the answer, but it’s at least clear the size won’t keep Stroman from pitching like a No. 1. He’s already done that. And it looks like he ought to do it again. We hoped you liked reading Marcus Stroman Discovered Roy Halladay’s Sinker by Jeff Sullivan!